Sensors can be used to monitor the three-dimensional device movement or change in the environment of the device. 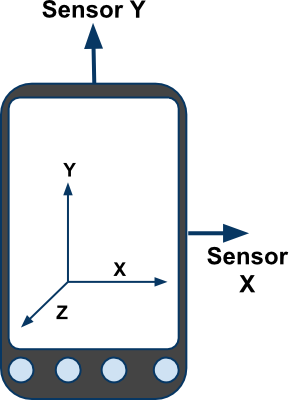 Android provides sensor api to work with different types of sensors. These are used to measure acceleration forces and rotational forces along with three axes. These are used to measure the physical position of device. These are used to measure the environmental changes such as temperature, humidity etc. to register and unregister sensor listeners etc. The android.hardware.Sensor class provides methods to get information of the sensor such as sensor name, sensor type, sensor resolution, sensor type etc. It provides two call back methods to get information when sensor values (x,y and z) change or sensor accuracy changes. void onAccuracyChanged(Sensor sensor, int accuracy) it is called when sensor accuracy is changed. void onSensorChanged(SensorEvent event) it is called when sensor values are changed. Let’s see the two sensor examples. A sensor example that prints x, y and z axis values. Here, we are going to see that. 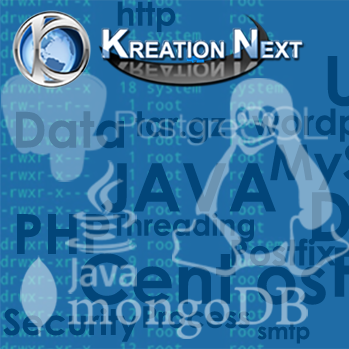 There is only one textview in this file. 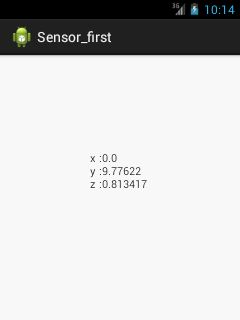 Let’s write the code that prints values of x axis, y axis and z axis.